I have been meaning to review this book for the last couple of weeks, but time seems to have run away from me, as I got too engrossed in the subject of politics. Finally, I am parked on the chair in front of my laptop and ready to tell you about Tara Stiles‘s fifth book, called ‘Strala Yoga: Be Strong, Focussed, Ridiculously Happy from the Inside Out’, which publication is very timely, as it focusses on helping you get your life back in balance with the help of a regular yoga practise. Last month Tara was in London teaching, with her baby bump noticeably bigger, yet it doesn’t seem to have slowed her down. She did appear more serene and somewhat mellower, with softer curves, guiding a large room of Strala devotees through a relaxing hour and a half class, but time was short and we didn’t get a chance to talk about the book, so my review is based purely on my own impressions after reading the book. Often what we lack in daily life is ease, so the tension that builds up within our bodies squashes our intuitional, physical and mental abilities, as well as creativity. Instead of lingering and breathing through difficult moments, we go rigid and become more tense. 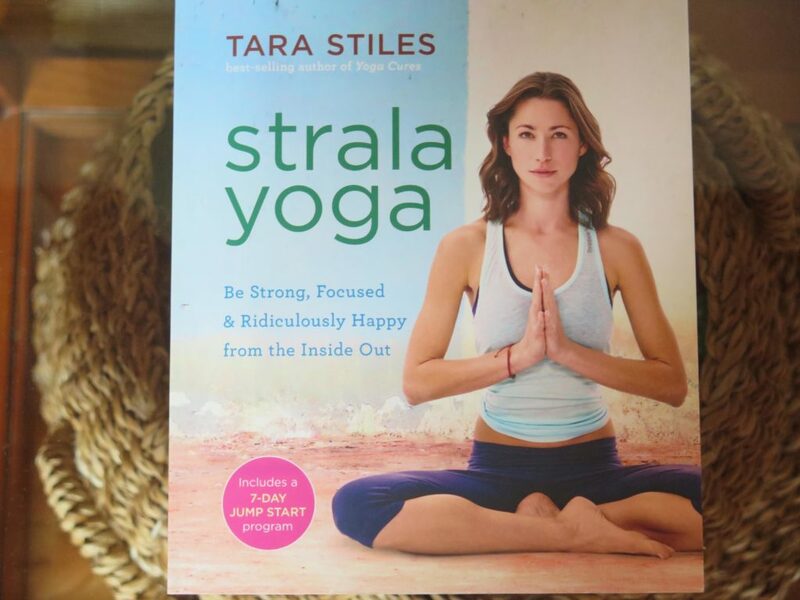 Tara wrote this book with a specific aim of guiding you into practising Strala yoga at home, on your yoga mat on a regular basis, so you develop an air of serenity off the mat. We rush, we get angry and frustrated, the world seems to be tilting into the wrong direction and with that we feel somewhat lost in the sense of direction and stance we need to be taking. Our frustrations affect the kids and that only worsens the situation, so I thought I would share this review with you ahead of the festive rush, hopefully giving you an idea on the choice of the Christmas gift for yourself or your loved ones, who might innately crave calm, yet don’t know how to achieve it by themselves and without going to the gym. Here Tara talks about what inspired her to create Strala and what effect tension has on our bodies. You will discover basic principles that will help you breathe better, take stock of your feelings and the importance of moving with ease. Often we forget that finding a quiet place in our home at the end of the day, sitting down, taking deeper breaths, lighting a candle and making ourselves a cup of tea will create a perfect set up for contemplating such obvious things like who are you, what do you want, how can you achieve it? Asking yourself questions about what makes you happy or unhappy is not a whim, it assures that you are able to think and adjust your sense of direction. As you read part one, examine the images in the book and try to follow the simple movement routine, listening to your body and doing what feels comfortable to you in the moment in time. Once you are comfortable with that, try to incorporate more breathing into your movement, letting it flow and not burst. Once you master that, your body will feel re-energised and be ready for deeper practise or more challenging poses – one of the things I like about Strala is that is doesn’t push you or set targets, it let’s you find your own way into the practise and put your own signature on it. Here you will find ten routines, some easier, for days when you are tired, others to help you focus your mind, introducing movements for more efficient body detoxing and improving your sleep patterns. No one will do it for you, so you do have to make a conscious decision to show up and making excuses, like ‘I am tired’ or ‘I felt like a glass of wine and sitting on a couch’ are all valid, but no one will improve your body or state of mind, if you don’t show up on the mat. It’s not about ‘no pain, no gain’, it is about taking a stand for your wellbeing and feeling better in your skin. – Energise is designed to invigorate your body and mind, bringing the focus back to your breathing. It includes the ‘Crow Crash Course‘, with focus on the flow of your body and NOT perfecting the pose, as well as ‘Handstand & Forearm secret tips‘ that even more experienced yogis are sure to find helpful. – RELAX, which is designed to de-stress you & dissolve tension. Our bodies are very powerful, but this practise is not about force, but about the softness. Let your knees & elbows ease off the throttle, while powering through hips and tummy. – BASICS will allow you to build strength and improve the range of motions, all the while focussing your attention on your breathing. This is a perfect routine for beginners, or if you want something simple, yet effective. – CORE is designed to bring awareness and strengthen your core muscles. You will move in different directions, challenging and strengthening all the areas of your mid section. Tara also reminds us in this section that flexing and engaging doesn’t necessarily help you build up the strength. You need to explore and get to know your body, in order to understand your own capabilities. There are also some helpful tips for hip rolls. – GENTLE is a restorative routine, aimed at helping you to soften the body, release tension and calm the mind. – TARGET PRACTISES offer simple routines, targeting everyday body needs and improving the way you feel. From waking up to better sleep, from winding down to dissolving stress, from detoxing to helping you get ‘unstuck’ from patterns that hold you back, this section of the book helps to remind us that caring for yourself should be a daily practise for each one of us. In the last section of the book Tara offers you a seven and thirty-day daily guides to introducing consistent change into your daily routine and establishing good emotional and physical practises that will help you face the world without averting your gaze. Each day is divided into four sections – morning, afternoon, evening, bedtime – and gives you guidance with a comforting friendliness and non-judgement, so you can do things that benefit you and make you feel good.